Thanks to everyone for turning out, and for the powerful speakers Braddock Municipal President Tina Doose, Mayor Elect Nickole Nesby of Duquesne, Gabriel McMoreland on behalf of ACCESS Mob, Braddock Resident Edith Bell, PPT’s own Chandana Cherukupalli, and Filmmaker Tony Buba for MC’ing. Pictures: (right) Braddock Council President Tina Doose speaking (left) PPT members Sue Scanlon and Emily De Ferrari, holding signs with quotes from residents. 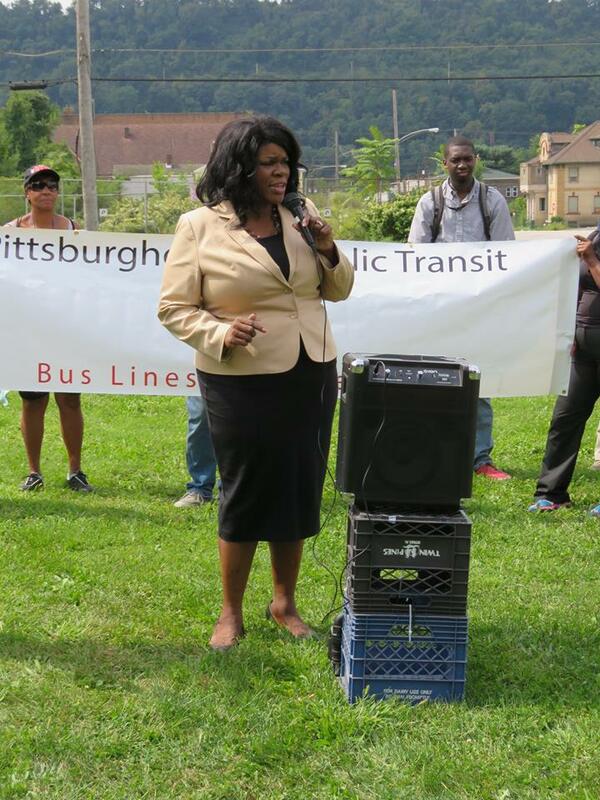 After PPT’s press conference and rally about the impacts of the BRT on communities in the Mon Valley, the Port Authority announced that they will hold the first public meeting in Braddock to lay out information about the impact of the BRT and answer questions. We are encouraging all those who will be impacted by changes to the 61 buses in Rankin, Braddock, Duquesne and Mckeesport to attend. The meeting will take place at the senior apartment building located at 325 Braddock Avenue on Monday October 2nd at 6:30pm. I have lived in Braddock for four years. I take the 61B to town. It’s always running late, especially when it’s raining. Transfer to go downtown? That’s impossible. What time would we get there? Getting off and on the buses is already difficult for me now. There are many times that the bus is broken and can’t lower. My legs can’t handle the transfers. It’s terrible. The big money is going to the big people. Put some more buses and quit cutting them out. At the very least get us a way to the busway from here! And if the BRT goes through this way, people will ride less. It’s bad enough with the increase in the cost, and now you want to make it worse. All you want is more money. and don’t care about people this side. To the Port Authority – we need to know what’s going on. Everybody else knows about this. But we don’t? That’s ridiculous. [Firstly], in this area, there is no place to fill up the bus cards. It’s not accessible to people here, and we end up paying a premium we can’t afford, especially with this transfer. Why do we need shiny buses and these changes?– it’s not going to benefit us! It’ll benefit students and business people, but they are not the primary riders of the service. We are! The primary riders of the Port Authority buses are swing shift minimum wage riders trying to get home, not students and business people– WE ride it! (and it doesn’t even come in inclement weather). We have always had problems with access. The Port Authority’s priorities are not for the people. We’re also in a food desert here! And you’re going to create it more! Fund bus passes instead and make it more accessible instead of doing this. This change is going to cause a lot of headaches and be very expensive in a community that’s already without.